Due to popular demand we’ve opened two sessions a night. Sells out fast – don’t miss out. Not sure who to see at the Festival this year? Not keen on seeing a comedian without knowing who they are? 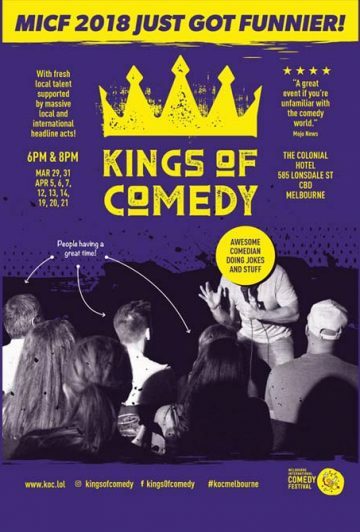 Kings of Comedy is back for our third Melbourne International Comedy Festival and we’re bigger and better than ever before. Come and experience the freshest mix of Melbourne’s best up-and-coming talent at the city’s best new weekly comedy room. We rotate the line-up every night so no two shows are the same! You can bet your bottom dollar it’s laughs aplenty and you’ll leave the night with sore cheeks, repeating funny moments over and over. With fresh local talent supported by massive local and international headline acts, it’s two shows for the price of one and a fantastic way to get a taste test of whose shows you need to go and see. Delicious meals available, so make this a night you will never forget at the Kings of Comedy Live & Uncensored.